Hansen » Roger Perron Inc. 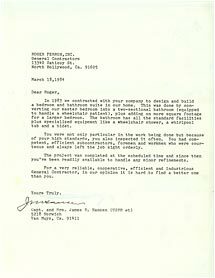 In 1983 we contracted with your company to design and build a bedroom and bathroom suite in our home. This was done by converting our master bedroom into a two-sectional bathroom (equipped to handle a wheelchair patient), plus adding on more square footage for a larger bedroom. The bathroom has all the standard facilities plus specialized equipment like a wheelchair shower, a whirlpool tub and a bidet. You were not only particular in the work being done but, because of your high standards, you also inspected it often. You had competent efficient subcontractors, foremen and workmen who were courteous and always left the job site orderly. The project was completed at the scheduled time and since then you’ve been readily available to handle any minor refinements. For a very reliable, cooperative, efficient and industrious General Contractor, in our opinion it is hard to find a better one than you.